Saline County is a county located in the state of Illinois. According to the 2010 census, it had a population of 24,913. Saline County was created on February 25, 1847. The county seat is Harrisburg. The county is named for the Salt springs within the county. Saline County is home to the largest KFC in the United States. There are three major towns in Saline County connected by US Route 45, and formerly by the now abandoned Cairo and Vincennes/Big Four/New York Central Line, from north to south, Eldorado, Harrisburg, and Carrier Mills. The county is named for the Salt springs within the county. Saline County was created on February 25, 1847 (Private Laws, 1847, p. 34) and was formed from Gallatin County. Present area, or parts of it, formerly included in: Gallatin County (1812-1847), Johnson County (1812-1816), Randolph County (1801-1812) and Knox, Northwest Territory (1790-1801). The County was named for Saline creek, so called on account of numerous salt springs in that locality. The County Seat is Harrisburg . Prior County Seats was Raleigh (1847-1859) and Harrisburg (1859-Present). 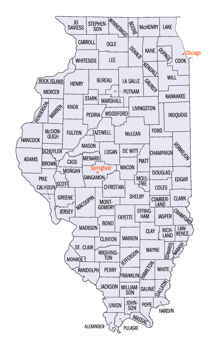 The county seat, Harrisburg is located in the southern portion of Illinois known locally as "Little Egypt". As reported by the Census Bureau, the county has a total area of 387 square miles (1,002 km2), of which, 383 square miles (993 km2) of it is land and 4 square miles (10 km2) of it (0.95%) is water. Saline county is located in south Illinois.The county area is mostly rolling hills throughout gradually rising to the Hills of the Shawnee National Forest and to the north of Eldorado there are flat lowlands. 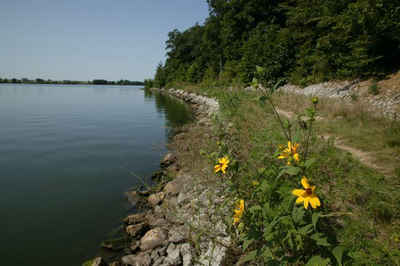 Saline County State Fish and Wildlife Area and part of Tunnel Hill State Trail is located in this county.